Unless you're the tiniest person in the world, the only way you're going to step inside a Jaguar engine is to put on these glasses. Admittedly, they're not the most stylish spectacles -- the oversized frames adorned with silver antennas resembling a space-age insect. But put them on and you'll be transported inside a virtual reality Jaguar, able to explore every nook and cranny of the luxury automobile without ever having to roll up your sleeves. The multimillion dollar Computer-Aided Virtual Environment -- called "The Cave" -- lets engineers observe and test the inner workings of a Jaguar long before a physical prototype has even been built. 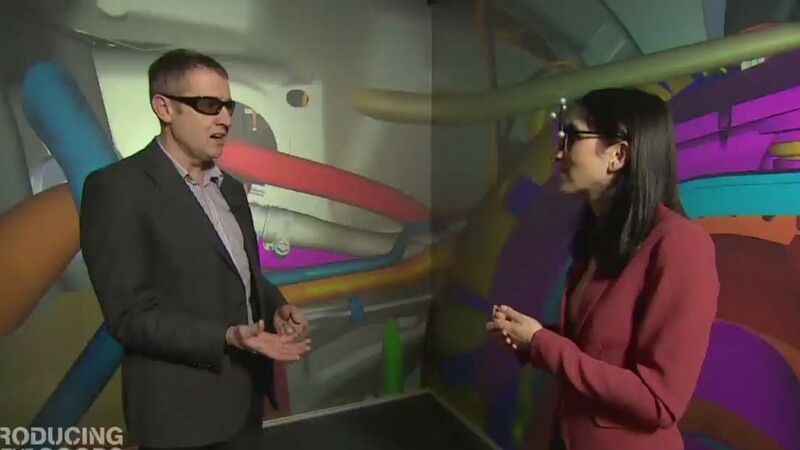 "Imagine a designer wants to see his concepts -- he might have to wait for eight to nine weeks to get a physical model," explained Brian Waterfield, Jaguar's virtual reality technical lead, at the Jaguar Land Rover Gaydon Center in Warwickshire, England. "Now, as soon as the engineer has developed the data, he can come down here, he can understand the lines, and he can understand the shape of the car -- all before he's got anything physical," he said. The Cave itself compromises three enormous screens and a ceiling, all alive with psychedelic-looking projections of the insides of a car. Those antennas on the glasses are actually tiny cameras, allowing the wearer to move around the minute "guts" of the vehicle. "You're immersed where you couldn't be in the real world. And this really gives our engineers a great advantage because you can put your head anywhere within this vehicle," said Waterfield, of the high-tech facility. "So this can really give us an advantage of getting inside the data, understanding what the issues are, and how we can engineer better." In the future, we could be seeing this technology everywhere from aerospace design to the medical training room, says Waterfield. And recreating the visual world is just the first step. "Imagine if you could hear things. Imagine if you could smell, touch, and taste things," said Waterfield. "We want to immerse as many senses as possible to give a virtual equivalent of the real world, inside a virtual Cave." Bar shrinking themselves to the size of a mouse, it could be as close as they get to the real thing.